For America’s workers, Labor Day marks more than the end of summer. It’s a reminder of the struggles we have won—and those that lie ahead. To many Americans, Labor Day has become an important way to send off the slower pace of summer and usher in the hustle and bustle of fall. To our nation’s working families, this Labor Day means so much more. It is an important moment to reflect on the courage of the working people who brought us Labor Day and the many working benefits we enjoy today. It is also a pivotal time to take stock of where our families, our economy, and our democracy are heading. Today, America finds itself in a position of incredible challenge. Half of all Americans now make less than $15 an hour. Of the ten fastest-growing jobs in America, eight are service-sector jobs that pay $15 an hour or less. Service-sector jobs are the heartbeat of our economy and our communities, from the folks who care for the elderly and our children, to those who cook and serve our food, to those who clean and secure our offices. Moving our economy forward must include making service jobs into good jobs with wages that you can raise a family on. That’s why this Labor Day, the American people are sparking a new movement, joining together for an economy and democracy that works for everyone. Fast-food workers have joined together to fight for $15 an hour. They have been joined by home care workers who are calling for $15 an hour for all caregivers. Just last week 27,000 Minnesota home care workers joined together in union, determined to raise wages and fight for quality home care for our seniors. Working people in Seattle fought for and won a $15 minimum wage for 100,000 people, and other cities are poised to do the same. Across our nation adjunct professors, airport workers, security officers, hospital workers, Walmart workers and other service-sector workers are standing up and sticking together. 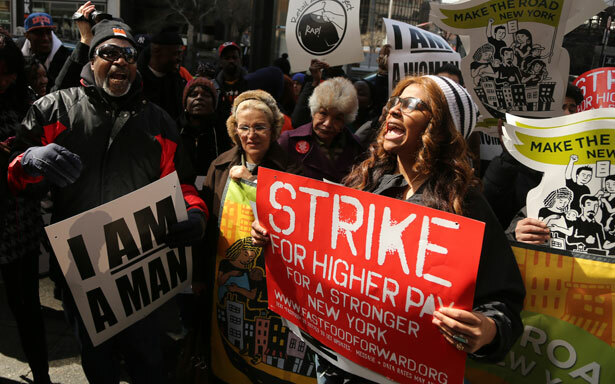 All told, 6.7 million workers have achieved better pay since fast-food workers began striking less than two years ago, either through states or cities moving to raise minimum wages or through collective bargaining. These brave workers are building the momentum to raise wages and get our economy roaring again. Yet the prosperity of our nation and growth of our economy depend not just on economic justice. A vibrant economy cannot exist without vibrant American communities steeped in the fundamental American principles of liberty and justice for all. The taking of Mike Brown’s life in Ferguson, Missouri, only weeks ago reminds us that social and economic justice must go hand in hand for America to thrive. To solve these issues, we need opportunities for all Americans to fully participate in our economy and improve the quality of life for their families. That’s why we must also fix our broken immigration system and uphold and protect civil rights and democratic participation for all Americans, not just the wealthy few. We must remember that America is a nation founded on the dreams of immigrants. Today the opportunity to achieve the American dream is jeopardized by a broken immigration system and a Congress that refuses to fix it. The time has come for us to free those immigrants who exemplify the promise of America from the shadows and bring them into the light of our economy and society without fear. When working people stick together, we have the strength to ensure that both our democracy and our economy continue to grow and progress. When America’s working families rise, America rises. This Labor Day, we have so much more to celebrate than just the end of summer. So many brave Americans are uniting to raise wages, raise our communities and raise America. Their efforts and successes are shaping up to be the largest, boldest and most inclusive movement by and for working people that modern America has even seen. I believe in a rising America, where together we can create an economy that works for everyone and a democracy where everyone has a voice. Mary Kay Henry is the International President of Service Employees International Union (SEIU). Mary Kay HenryMary Kay Henry is the President of the Service Employees International Union.